There is something magical about pop-up cards because they have the ability to bring out the inner child in a person. Pop-up cards can be super simple or extremely intricate in detail, but they all are fun. This Christmas pop up card project is beautiful and easy enough for beginners to make. The templates and die files are included so all you have to do to make this card is to cut and paste. Kinda reminds you of elementary school right? The card, however, doesn't look like it was made in elementary school. Make a couple and send them to your special friends! Who doesn't want to be a kid again? Cut out all the pieces required for the assembly of the card with an electronic die cutter or by hand if desired. Die cut files compatible with most machines can be ​downloaded here. Take two of the 1 inch by 4 1/4 inch strips and fold at the score lines. Secure the end tab to the body of the strip with a glue runner or a bit of tacky glue. Score the 5-inch by 10-inch blue square with a bone folder in the center and fold. This will be the card back. Use the glue runner to apply adhesive to the back and bottom of each folded square strip. These two pieces will act as "paper hinges." Place the two paper hinges onto the card center fold as in the photo above. Apply adhesive to the front of the paper hinges and press the tree cutout onto the hinges firmly. Fold two 1/2 inch wide tabs into square paper hinges and attach with adhesive to the front of the tree cutout using the photo above as a reference. Apply glue to the front of the hinges and press the deer's legs down firmly to secure. Glue the paper stars and moon to the back of the inside card as in the photo above. Cut a small piece of colorful ribbon and glue it around the neck of the reindeer. This will be a reindeer scarf. Glue the white card stock rectangle to the bottom portion of the card. Option 1: You can use a gel or glitter pen to write your Christmas greetings by hand. 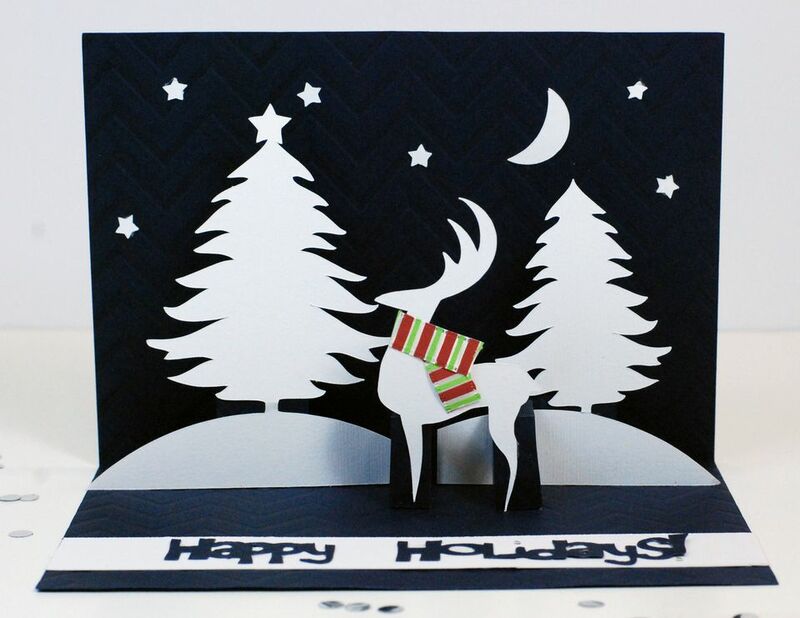 Option 2: Cut out the words Happy Holidays from navy blue card stock and glue onto the center of the white card stock square. Your card should now look like the photo above. There should be a 1-inch margin of space between the back of the card and the tree cutout. There should a 1/2 inch margin of space between the tree cutout and the deer.